Imagine boarding a train in New Albany and stepping off in Downtown Louisville, all the while watching carelessly from a window at riverboats passing slowly on the Ohio River. Louisville once had a superb train system running everywhere you could imagine throughout the city and region, radiating out like spokes on a bicycle wheel from Downtown. One span in particular occupied a stretch roughly taken by Interstate 64 today. 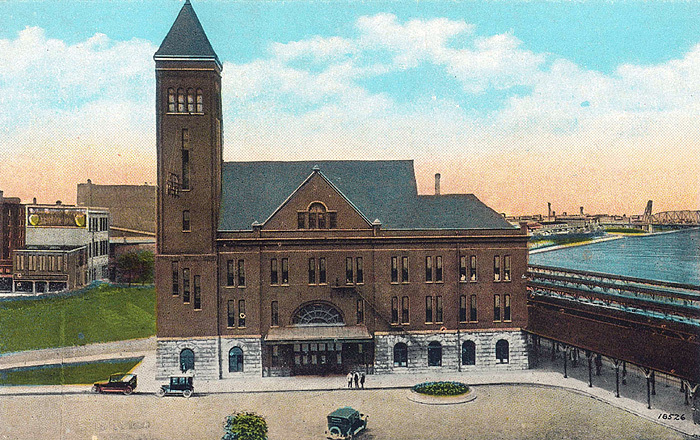 There are still a few remnants to remind us of the riverfront train line that began in the 1800s, but the transportation option is far gone in the history of Louisville, along with its grand station at Seventh Street. Tipster R. David Schooling sent in the above graphic (and a few more below) demonstrating Louisville’s extensive riverfront train systems in Kentucky and Indiana. 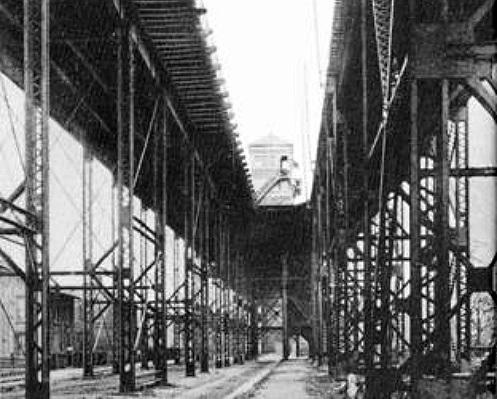 He reports that electric trains (preceded by steam-powered trains) ran on an elevated track beginning around First Street around the clock. Train service was halted only a few times in its history by severe weather (that we’ve recently become reacquainted with). Flooding twice stopped the track, once in 1937 and again in the 1940s as waters rose to unprecedented levels. The tornado of 1890 also brought the trains to a standstill (as it did with most of the city). 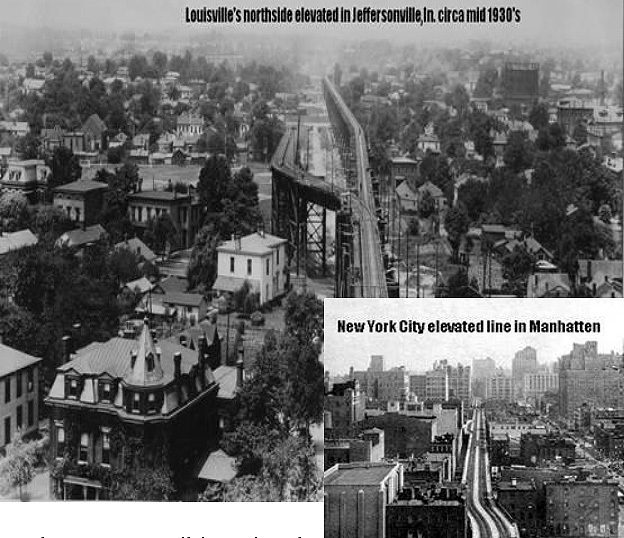 Schooling also points to the elevated rail connected to the Big Four Bridge in Louisville and Jeffersonville as evidence to Louisville’s elevated rail history, with tracks flying high above the rooftops of Victorian mansions and one train station evidently 60 feet above the ground. (A couple photos of the Big Four elevated rail are below.) The new pedestrian approach to the Big Four Bridge in Jeffersonville will roughly follow the original train path from the bridge. The above diagram overlaid on the 8664.org vision of Downtown Louisville demonstrating the path of Louisville’s historic elevated rail unencumbered by an Interstate 64 is captivating. Imagine a modern train gliding silently along the riverfront on a fraction of the elevated right-of-way required by the highway. Passengers free to take in the changing Ohio River and kinetic skyline without the burden and safety issues of paying attention to traffic. Heartbreaking. Just like many other towns, when rail fell out of fashion Louisville ripped up the street car lines and replaced them with the “modern” bus routes. Now, like all things, buses are so uncool and trains are back in vogue. How many millions it would take to put in light-rail, when we already had it once and probably spent millions to tear down the rail lines and replace it with elevated interstates, the ultra-cool “wave of the future” in the 50s and 60s. Same story, different decade (or make that century). There still alot of the old rail around though. I was driving down East Liberty the other day around Bargain supply and you see some of the track sticking up through the concrete where some of the pavement has come loose. It seems like you could pull up the concrete and rehab alot of the lines if someone had the gumption and $$$$ or vision to. It’s true, Thomas, that there are tracks still in existence under many of Louisville’s older streets. Check here and here for a couple views of tracks I found previously. I’ll post another this afternoon. Here’s a video of a modern streetcar in Seattle as well from an old post. Unfortunately, it’s usually impossible to reuse the original tracks for new trolleys due to technological shifts and extreme disrepair. It’s a shame we let our original transit system fall by the wayside in the first place. I recall some of that high iron on the Jeff side of the Big Four. 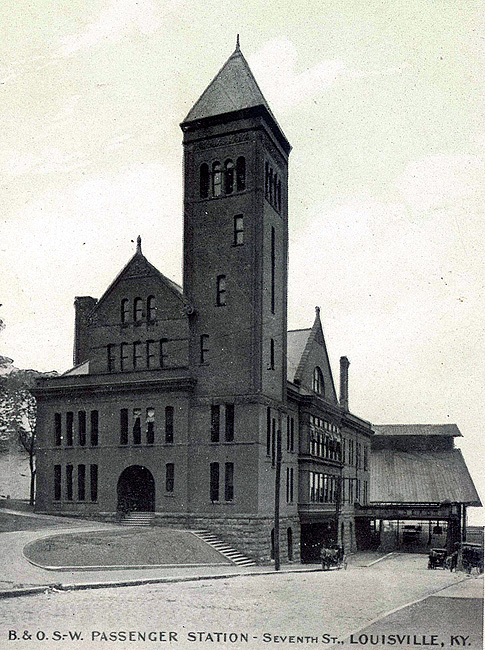 It was still standing in the very early 1970s. 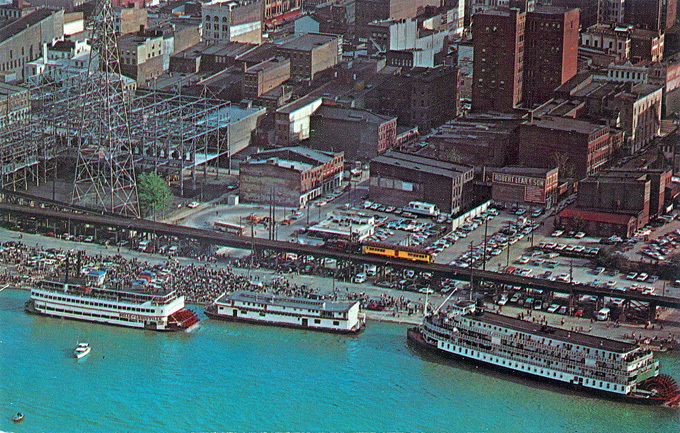 But that colored postcard of the riverfront with the Belle and the Delta Queen is a facinating record of what used to be. I think I can see what looks like maybe a railcar on that elevated rail line. I don’t think Louisvilles elevated lines were quite like the ones in Chicago and NYC because they seemed to be affiliated with mainline roads. Urban Ls in NYC and Chicago were built primarily for mass transit. Louisville’s elevated rail experience of course could never equal say… Chicago or New York. The ultra urban scene in those cities are simply unequalled, period. 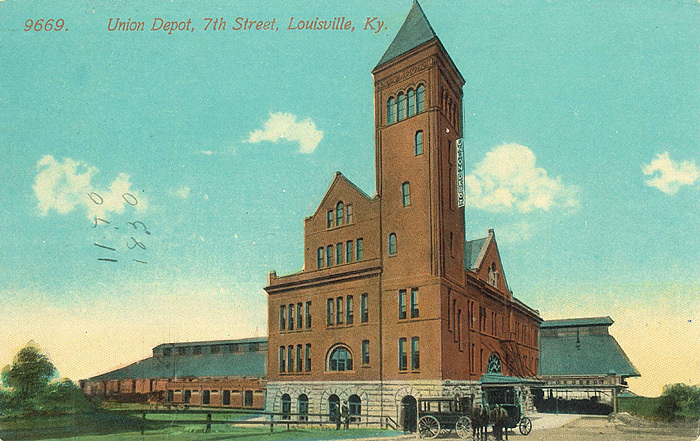 However Louisville in the late 1800’s was a far different city indeed, city streets were aclamor and jammed with streetcars, and horse drawn conveyances, and the street scene was far denser than today, and yet three car elevated rapid commuter trains ran every 15 minutes between New Albany and downtown L’ville. It is an almost entirely unknown fact that a sub-river tunnel was even planned, and would have per drawings, have had a substantial sub-way trackage, under many Louisville streets, albiet no planned intermediate stations,(from Jeffersonville) bar the surface, exit near Broadway. Although that plan didn’t come to pass, a modern rapid transit, elevated line with swift 3 car electric trains did eventuate instead, ONE HUNDRED SIXTEEN YEARS AGO! The K&I Bridge Co. commuter trains had nothing to do with the later operation of the 1908 L’ville & Nrthrn trains, (a trollized version) which after crossing the river merely ran on streetcar tracks. See book -“Glimpse of Kentucky”- Ky & Ind. Bridge entry. The K&I Bridge (NOT “K&IT”) commuter trains made 10 minute transit times compaired to 30 minute for streetcar running times. Also, the fact was the vastly larger amount of traffic on the elevated route was produced by the constant running of the K & I commuter trains NOT the mainline trains of the B&O, Southern, and Ill Central. …So much so that the old Sanborn maps show the route as the K&I Daisy Route ….Not Ill.Central. This route was taken by nearly 2 million commuter passengers by late 1907. For urban commuter trains to share trackage is not uncommon or conflicting at all, even in the mega-cities. Chicago’s myriad of Metra commuter trains stretching out in all directions share with BNSF, CSX and other lines with no complications, It is only the Loop area that doesn’t share lines. Louisville’s elevated original steam powered lines were electrified 2 years ahead of the famous Chicago “L” trains. The post card view of the elevated is from a Derby Steamboat race in the 1960’s. The train show is the rebuilt Civil War locomotive the “General” and the “Jim Crow” combine that accompanied it on its Civil War Centennial tour. The coach is preserved at the Kentucky Railway Museum in New Haven, KY, but is in need of repair. I am trying to photograph all existing train depots/stations in Kentucky and Indiana. I am also interested in those that no longer exist. Any help would be appreciated. Brandon, once again, you have produced another masterpiece. Thank you. TARC has the statutory authority to bring back light rail and the ability to fund it with an increase in the sales tax. It is up to the people to demand it and vote for it. As it stands today, the “community” is committed to building two new bridges and continued development in the East End and Southern Indiana. Are you advocating for light rail and if so, what areas would you propose be serviced by those lines? I am advocating for streetcars, but open to the idea of heavier rail such as the T2. I think the T2 route is a great start. I also think that a loop including all of Broadway and Market/Main should be considered. Would a downtown loop really get that much usage? I’m not familiar with the T2 route. T2 basically runs parallel to I-65. Usage of the loop would depend on lots of variables, including future development along the route. I think a rail system between UL and downtown would be worth exploring as well. Have one line come down 4th St towards Main and another going back to UL down 3rd St. I know it had been discussed before but wish it would get some more attention.